Today’s post is a re-post – one I wrote earlier this year but didn’t publish here on this blog. It was written before I began to edit my reflections to shorten- so I apologize for the length and rambling nature of this one. The Spirit gave me lots to think about in today’s readings but what emerges at the top of the list is this: humanity is created in God’s image inside and out and in every cell of our being we are made to be like God – not God, but like God. I got here circuitously…a twisted bunny trail that began with a stop when I encountered a couplet in Psalm 17 that I understood on one level but suspected floors of understanding below the surface existed. The first step onto this bunny trail was the idea of seeking meaning – a unique human attribute. The gentle push onto the trail came from the psalmist’s use of a phrase I had never thought about before and was curious about (see later – I’ll get to the couplet eventually!). So I went on a search – I sought meaning. And it seems to me that we find meaning in two places. First in Creation, itself. The tangible world and elusive time around us into which we are born, and that before us, and that after us – our particular life experience in the ONE universal experience of God’s creation. The second place where we find meaning is in the Word, (Scripture, Jesus). In Creation and in the Word, God provides answers, gives us a place to connect dots – find meaning – and come to know God as He comes to know us. So back to the second psalm reading today that began this little trip. It was a familiar phrase which I understood figuratively but not literally. I had no idea from whence it came or how the images it conjured added up to mean what I knew it to mean. The apple of the eye most would understand as ‘a cherished one,’ though an image of an apple of the eye does not come to mind – just the idea. The second phrase in the couplet, shadow of your wings is easily understood and I am able to SEE such a shadow. But apple of the eye? What IS that? Deuteronomy 32:10 10 He sustained him in a desert land, in a howling wilderness waste; he shielded him, cared for him, guarded him as the apple of his eye. Lamentations 2:18 18 Their heart cried unto the Lord, O wall of the daughter of Zion, let tears run down like a river day and night: give thyself no rest; let not the apple of thine eye cease. Zechariah 2:8 8 For thus said the LORD of hosts (after his glory sent me) regarding the nations that plundered you: Truly, one who touches you touches the apple of my eye. Sirach 17:22 22 One’s almsgiving is like a signet ring with the Lord, and he will keep a person’s kindness like the apple of his eye. And all of these uses conjure the same thing – something (the Torah, commandments, WORD) or someone (Moses, Israel, God’s chosen) cherished above all others. But, again, what IS an apple of the eye, literally, not figuratively? Fascinating. The apple of the eye – a mini-me! 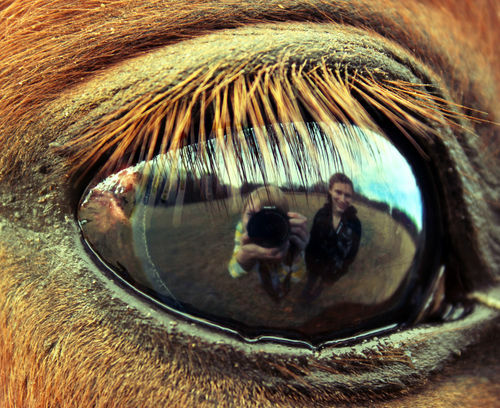 As in this photo I found of a photographer’s own reflection in their horse’s eye…look closely. So, somehow the Hebrews in their seeking to find meaning, their seeking to know our God, first of all came up with a word that described what they were seeing in the dark part of the eye when they looked upon another and then they used that word figuratively to describe how they understood God sees us, takes care of us, cherishes us. We are, after all, made in God’s image… mini-mes… we are. Ah, an apple – rearing its provocative head. It always seems to show up when things of meaning, knowledge, wisdom, deceit, good and evil are being discussed. Yet, surprisingly, the apple’s association with such meaning doesn’t emerge from the Hebrew Scriptures and the story of the tree of knowledge in the garden. No, when Scripture was being translated by the Catholic church from Hebrew to Latin, theology (and that dreaded word, context) informed translation as much as anything. At that time, (4 CE) the book of Genesis, among other things , was considered a revelation about good and evil and humanity’s choice to know, to be wise, to be like God at the invitation of the evil serpent. So, eating from the tree of knowledge was about good and evil and the Latin word for evil is malum, and the Latin word for apple is also, malum – hence the forever link between apple and knowledge and evil. Okay, so back to the bunny trail and the idea that we are hard-wired to seek meaning. As the body cannot live without food, so the soul cannot live without meaning…some level of meaning was the only thing that kept people from total despair and suicide during the Holocaust. Humans are creators of meaning, and finding deep meaning in our experiences is not just another name for spirituality, but is also the very shape of human happiness (114). acquiring knowledge includes, in part, being able to distinguish right and wrong, making judgments, like God, the serpent promised, mini-me? And where I land at the end of this bunny trail is simply in a place of awe of the Word. It forever feeds, teaches, and most importantly, reveals my God. Who’da thunk it? Apple of the eye emerging from the reflection of themselves our ancient brothers and sisters of Israel saw in the iris of the eye …a mini-me. A phrase that speaks through the ages, helps me see and comprehend more fully that we are all created in His image – inside and out. We are made in His image, inside and out. We are sought to seek, to know Him so that we know ourselves OF Him. This entry was posted in Whispers and tagged context, GOD GENE, Psalm, scripture. Bookmark the permalink.